The store isn’t run from the top down, we think of teamwork as important. Everyone develops the ability to do any task, and they all work together. Today we’ll be visiting Sarashina Horii in Azabu-Juban’s shopping street. 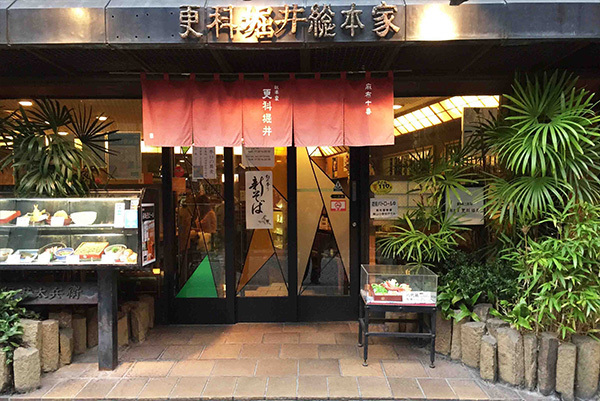 The store was established when the first owner switched from making linden tree bark fabric in Shinshuu to running a soba restaurant, and it opened Azabu-nagasaka-cho in 1879. Now it’s a popular restaurant in Azabu-Juban’s shopping street. On the weekends, there’s a line extending to outside the store all day long. Azabu-Juban is a nice place. It has a unique atmosphere with a combination of relaxed old Tokyo neighborhood and elegant embassies and upmarket houses. I love this shopping street! Horii: Hello, Thayne-san. I’m Horii, the owner of Sarashina Horii. This restaurant has a lovely atmosphere. It’s very Japanese. It’s just the kind of place foreigners dream of visiting (laughs). I hear that it’s been more than two hundred years since this restaurant was founded. The restaurant must have been an essential part of the town. And this town still has that kind of warm-heartedness. Horii: Yes, I’m grateful for it. It’s a great town. After that, my father went independent and built the restaurant here. At the time, I was a university student in the philosophy department, a literary type, but as soon as I graduated I decided to work at the restaurant. Did you have any doubts about your career? Horii: Yes, it’s been 35 years since then. 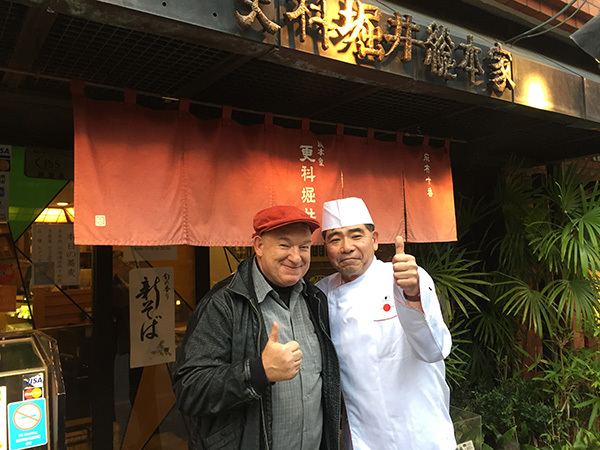 Mr. Horii is currently trying to show Japanese food and Japanese culture to the world, so he goes to things like Japanese food festivals in the US and the Milan Expo, and accompanies the Prime Minister abroad to support best selling Japanese products. That’s amazing! You go around places in the world that make soba, speak with them, and let them see and taste how you make it. I’m making a box for my soba-making tools so that I can go whenever I’m asked. You’re certainly full of energy, do you also run the store your way from the top down? Horii: No, the store isn’t run from the top down, we think of teamwork as important. Not teamwork in the sense of dividing the work into individual tasks and putting it back together at the end, but where everyone develops the ability to do any task, and they all work together. Horii: Yes, we want them to become people who can do anything when it comes to soba. Making the noodles, frying the eggs. Also promotion, nutrition education, restaurant consulting… I want them to grow into people who think about, study, and try many things. Four years ago, I started hiring new graduates. Wow, that’s surprising. How many people do you have working for you now? Horii: We have 21 full-time employees. Eight of them are women. We also have around 60 part-time workers. You really treasure those people don’t you? And you help them expand their skills, regardless of their gender. Horii: Yes, if they have soba in their hearts, they can do anything here. “If they have soba in their hearts”. As long as they stick to that, they really can do anything. Their horizons will expand. I run a company too, so this conversation is really inspiring. 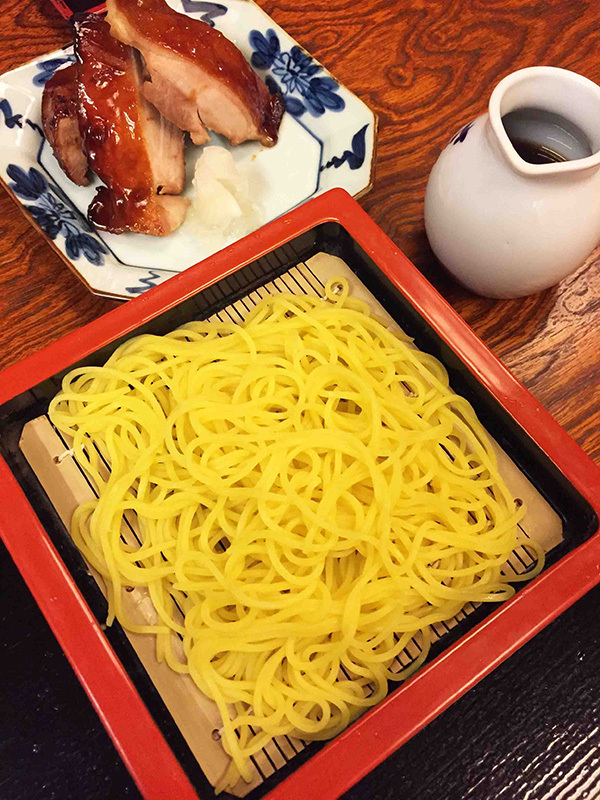 Horii: Now, please try our soba noodles. 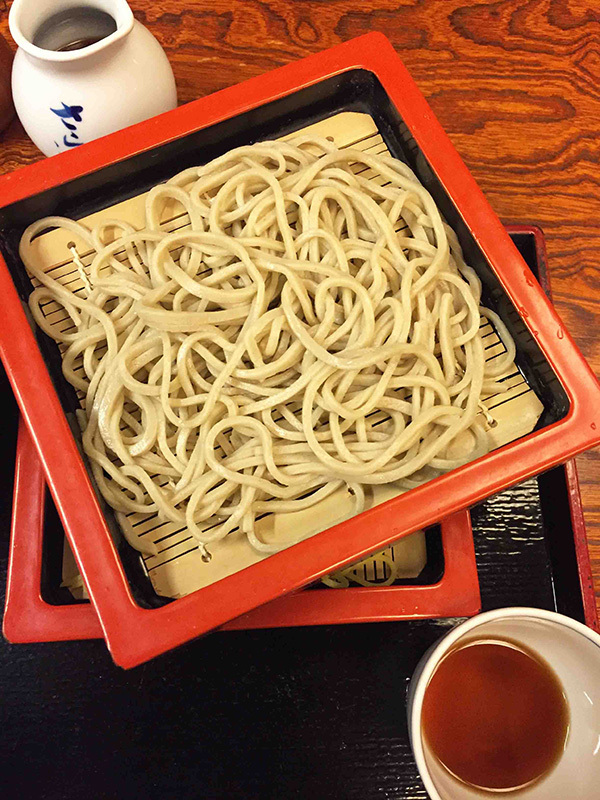 Photo: Sarashina Horii’s mori soba is pre-Edo style soba made with hand-ground flour. 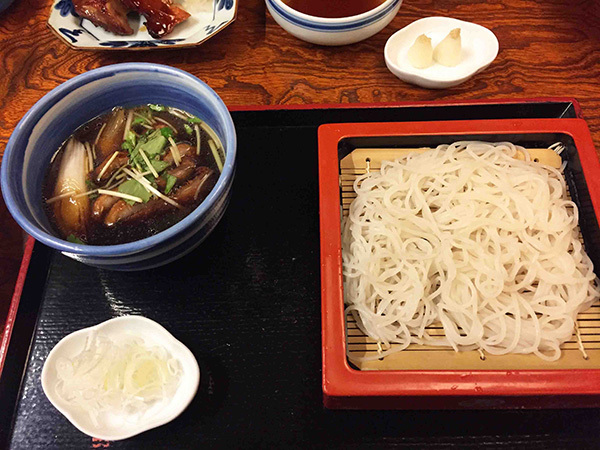 Photo: Sarashina, pure white soba noodles made with polished buckwheat. Photo: Seasonal kawari soba, gardenia flavor. Both the noodles and duck soup are delicious, it’s an amazing pairing! Sarashina noodles really are beautiful. You could search the world and not find noodles as beautiful and delicious as this. Try the seasonal kawari soba too. Seasonal ingredients are kneaded into sarashina noodles, and they change one to three times a month, so there are 22 flavors every year. It’s fun, isn’t it? Delicious and fun. Horii: Cooking is something you put work into, I think. And what’s important how pleasant and delicious you can make things for the customers. 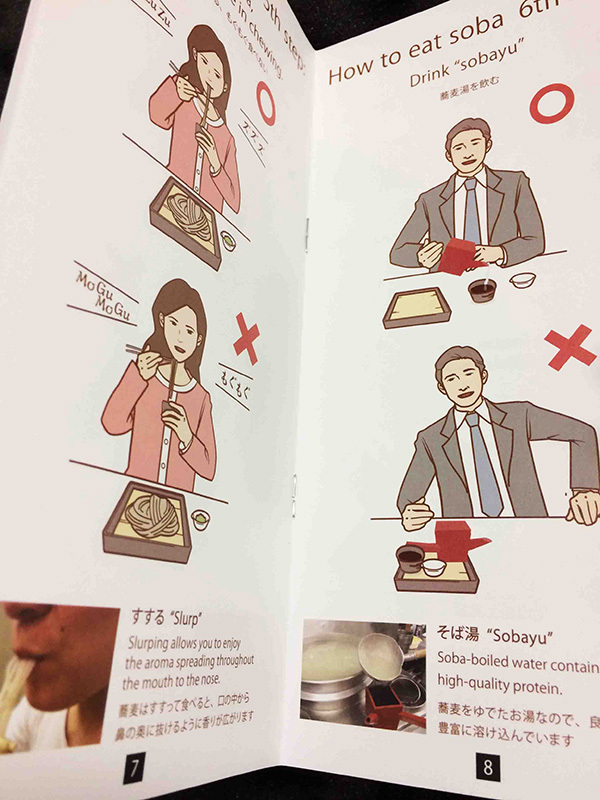 Oh, right, we made English pamphlets for foreign customers who are eating soba for the first time. Wow, this is amazing. I think foreign tourists will be really happy. I’m going to look at this and brush up on my studies too! Thank you for speaking with us today. We’ll come again!